Matukar Panau is a highly endangered Oceanic language spoken around 45 km north of Madang, Papua New Guinea. Matukar is a village with around 500 people and Surumarang is a smaller hamlet with around 200 people. Of these 700 people, most (540) are under 30 years old and are unlikely to speak more than very basic Matukar Panau. Their first and dominant language is the English-based creole Tok Pisin. Another 130 or so people are between 30 and 50 years old. Their first language is Matukar Panau, but many speaking instead primarily Tok Pisin. The dominant language for most of these people is certainly Tok Pisin, but they can and will still use Matukar Panau, and will often do code-switching with Tok Pisin. Around 25 people are over the age of 50, and while these speakers are also Tok Pisin speakers, they still speak Matukar Panau often and well. Although the youngest adults and children speak primarily Tok Pisin although there is still societal value in conducting small social rituals in Matukar Panau as opposed to Tok Pisin. For instance, greetings are often done in Matukar Panau such as good morning (tidom mami uyan), good day (sabi uyan), good afternoon (raurau uyan) or good night (tidom uyan), how are you doing? (uyan madonggo [sitting good] or uyan turago [standing good] or mateng ti, abab ti [no sickness, no wounds]?). Someone who primarily speaks Tok Pisin, may still ask in Matukar Panau if someone has betel nut (mariu), lime (kau), mustard (ful) or cigarettes (kas).The person asked is expected to give one or two small items to the asker. Anderson, G, Barth, D & Forepiso, K 2015, 'The Matukar Panau online talking dictionary: collective elicitation and collaborative documentation', in I. Wayan Arka, Ni LuhNyoman Seri Malini, Ida Ayu Made Puspani (ed. 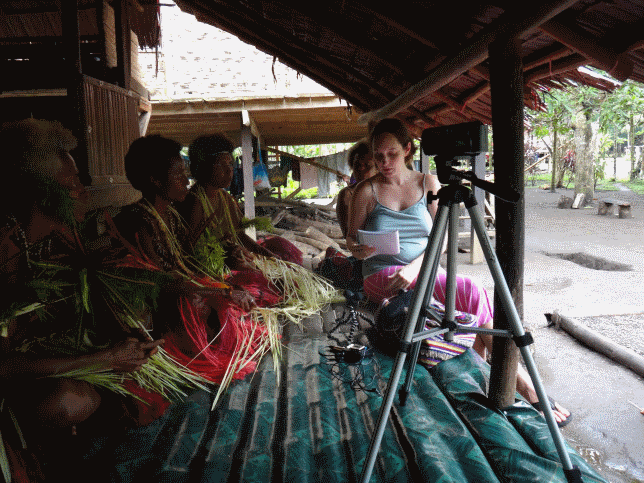 ), Asia-Pacific Linguistics: Language Documentation and Cultural Practices in the Austronesian World. Papers from 12-ICAL, Volume 4, Asia-Pacific Linguistics, Canberra, Australia, pp. 111-126. Anderson, Gregory D.S., Danielle Barth and K. David Harrison. 2010. Matukar Talking Dictionary. Living Tongues Institute for Endangered Languages. http://matukar.talkingdictionary.org Barth, D and G. D. S. Anderson. 2015 Directional constructions in Matukar Panau. Oceanic linguistics, 54(1), 206-239. Barth, Danielle (collector), 2009; Social Cognition Project (SocCog), Digital collection managed by PARADISEC. [Open Access] DOI: 10.4225/72/56E9769B1ADD9 Barth, Danielle (collector), 2010; Matukar Panau Language Documentation (DGB1), Digital collection managed by PARADISEC. [Open Access] DOI: 10.4225/72/56E97A2420C64 Barth, Danielle. 2018-. Matukar Panau corpus building for the study of language use in context. London: SOAS, Endangered Languages Archive Gonzalez Ochoa, Simon, Travis, Catherine E., Grama, James, Barth, Danielle & Ananthanarayan, Sunkulp. 2018, 'Recursive forced alignment: A test on a minority language', 17th Australasian International Conference on Speech Science and Technology, ed. Julien Epps, Joe Wolfe, John Smith and Caroline Jones, The Australasian Speech Science and Technology Association, Inc., Australia, pp. 145-148. The corpus contains some of the transcribed audio files collected since 2010.